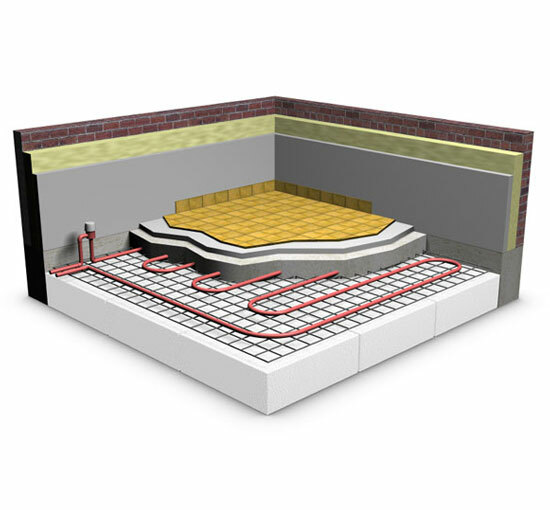 Which Underfloor Heating System should I choose? Need Help? You will probably be aware that there are many different systems on the market, all making different claims. With modern manufacturing methods, most products on the market are very reliable, however there is a vast difference in performance so it is wise to do your research and chose the product that is right for your project. 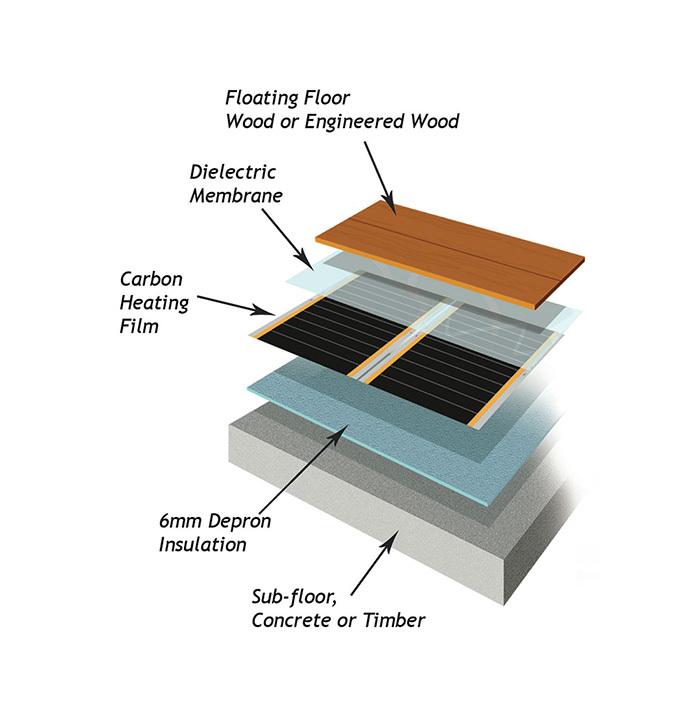 Some systems on the market have a very low output (from 60watts per sqm) and are designed for use in countries which have far better insulation standards than the UK. We have been actively involved in the design process for the systems we sell and they are tailored specifically to the UK’s requirements. However a higher output does not mean higher running costs, it simply means that the desired temperature can be achieved much faster. Once the temperature is reached, the sophisticated FH-01 thermostat controller delivers just enough power to maintain the temperature you have set. Single or twin core cables? An important point to note is that we only supply ‘twin core’ heating cables. Twin core cables have two heating elements inside which gives two important advantages over ‘single core’ cables. Firstly you only have one end to connect to the power supply, which is a big advantage during the installation process. Secondly the EMF (electromagnetic field) which is created in all electrical appliances and wiring is dramatically reduced, to a level where it is almost immeasurable. Whilst this may not be a major concern for you today, there is a lot of research currently being undertaken around the globe into the effects of EMF and it is impossible to predict what findings may occur in the years ahead. As with many things in life, it is difficult to find a ‘one size fits all’ product, so in order to cater for all room types, we supply 3 different under tile heating systems, all of which utilise the same high quality cables. For smaller rooms and areas with awkward shapes, we offer the cable kit option, where the 3mm heating cable is supplied on a drum with tape to fix it to the floor. For larger areas where you want to cover the floor quickly, we offer the cable mat option in two power outputs. 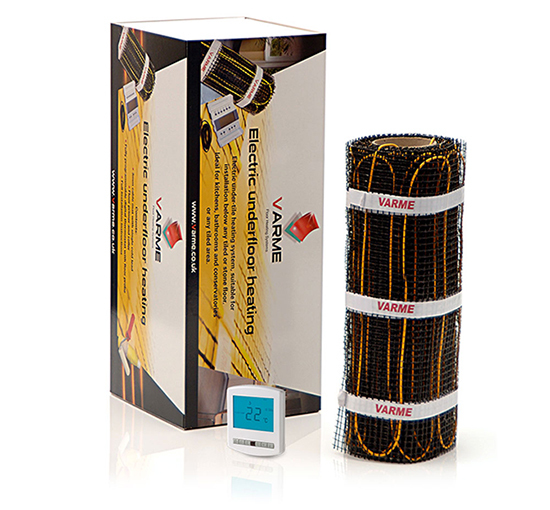 Varme mat 150 gives 150 watts per sqm heat output which is ideal in internal rooms. Varme mat 200, gives an increased 200 watts per sqm making it perfect for conservatories and other areas of high heat loss. Please note: All cable mats come complete with Digital Thermostat, Floor Primer, Roller, Floor and Probe. Underfloor heating is considered to be the finest and modern way to heat your home/work place, It is less obtrusive and more energy efficient than unsightly radiators and it’s also good for your health. Utilising warm water pipes that are completely concealed in the floor of the property gently radiate heat evenly throughout the room, this ensures that there are no excessively hot spots or cold spots. With Gas Underfloor heating it gives the freedom to position furniture where you like without worrying about where the radiators are positioned. Please get in touch by phone on 01159 834 259 or email if you require further information.